Richard B Morison was born in Perth, Scotland in 1826. He was fourteen when he arrived in Canada in 1840, having come with his father and aunt on the same ship as the party led by Donald 'Phu" McPherson which settled in Crieff. The sea voyage took five weeks. Morisons settled in Niagara, and by 1845 RB was in St. Catharines learning cabinet making. For the next couple of years he worked in a drygoods store in Dundas with his brother Thomas. He was just twenty one when he came to Morriston in 1847. In the early 1840's, Morriston was not yet even a village. There was just a tailor, a blacksmith, and a little store huddled together on Brock Road. They were surrounded by tall dead pines and Brock Road was nothing more than an ox- trail through the bush. These first few people gave the little settlement the name Elgin after a town in the Highlands of Scotland. Morriston began to take on the aspect of a village when Brock Road was improved about 1844. Guelph was growing and needed to get supplies up from Dundas. There was a road from Dundas to Guelph via Galt, but Brock Road was more direct. The improved road attracted new businesses, such as the shoemaker who opened a shop in 1847 and RB Morison, who arrived the same year to start for himself as a storekeeper. He started his business by carrying his goods on his back from Dundas and setting up in the corner of the blacksmith shop. 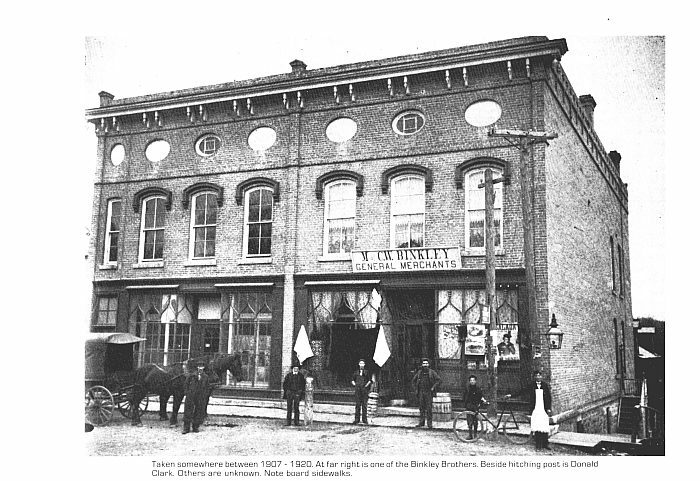 By 1849, two years later, he had done well enough to build a new general store. He put up a frame building on the east side of Brock Road. The village was renamed Morriston after him in 1850 and in 1854 he was appointed postmaster . In 1855, he married Sarah Mills. She had been born in USA in 1831 and was living in Brantford when they married, but they married in Caledonia. They had five children during their marriage, Charles, Minnie, Richard, Emma and Florence, all of whom are buried here with their parents. In 1858 RB Morison was appointed a commissioner, a sort of para-legal position;, he could take oaths, draft documents and so forth. Fire was a constant hazard in the days of wood stoves when buildings were log or frame construction. Morriston had several disastrous blazes in the early days. In 1860 RB's s warehouse burned down, taking part of the Morriston Hotel with it. RB hired Karl Beese, a local German mason, to take on the job of rebuilding. The new store was relocated to the opposite side of Brock Road, that is, the west side. It is still there today, the three storey brick building you see on the corner of Calfas at the stoplight. RB employed his own tailors, shoemakers, and milliners in his store. He carried a large stock of goods He then bought another business in Hamilton at the corner of Main and John Streets, but we don't exactly when, or whether it was another store or some other kind of business. He sold both the Morriston store and his Hamilton business about 1869 and moved to Guelph. Wes Binkley became the new storekeeper in Morriston . The 1890's was the high point of the village of Morriston. It had three hotels, three blacksmith shops, two butcher shops, a tailor, a millinery shop, two shoemakers, a brewery and a weaver. There were a number of stone masons, carpenters, framers and carriage makers living in the village. There was a harness shop, an undertaker, a mill and a doctor. Five hundred people lived there. R.B's next venture was in the lumber business. He bought a sawmill at Goulais Bay, north of Sault Ste. Marie and invested in "timber limits" which is the license to cut timber from a designated area. But he had no experience in this business, and ended up losing all his money. He returned to Morriston, about 1875 "poorer and wiser" as his obituary says. He went back to being postmaster, and was also appointed Justice of the Peace, and was the local man to see about legal matters, writing wills, agreements and so forth. He surveyed many of the building lots of the village too. He lived out the rest of his days in the village and died in 1907 at the age of 83. Sarah died in 1908 at the age of 77. The story of his life is a good example of the entrepreneurial spirit of the early pioneers. He was probably the most important person in the village for a few years. and at his death in 1907 was described as a "shrewd progressive businessman".., "to whom the village owed much of its prosperity" . "Puslinch Profiles 1850-2000" Puslinch Historical Soc. "West Puslinch Genealogies" by Betty Ramsaur Ferguson. Children of Richard B. Morison and Sarah T. Mills all buried at Crown with the parents: Charles B. 1859-1933, Minnie (Isabelle) 1858-1941, Richard C. 1862-1938, Emma Ann 1863-1944,	Florence C. 1870-1932.